When you look at a heart, it's generally a triangle shape. I wanted to try a heart with more hearts inside so I went for a generally triangular shape with a dimpled ring at the apex of each point, which gave me a really odd looking outline. It smoothed out a little with the next row, but I really wanted a lacier outline. I got the lacier outline, but the bumps at the top could have been more pronounced. The finished heart is about 3.25 inches across and 3 inches high done in size 20 thread. For some reason the drawing of this one is really compressed at the top. 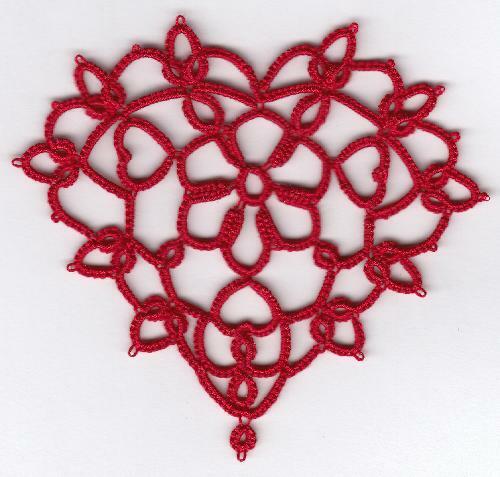 I might be because the thread of the dimpled rings on the top bends down toward the bottom of the heart making more space than what appears on the line drawing. 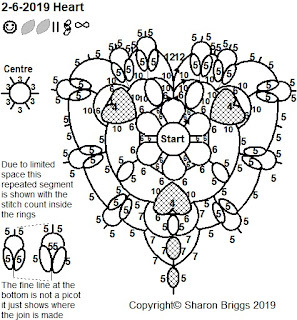 In any event, I had to cram too many stitches for too many rows in at the top, so I showed the stitch count for the rings of the repeat motif inside the rings. The joins for this ring, chain, ring motif at the top of the heart, are into the base of a ring, or to joins, of the previous row. Try getting that to fit into a drawing and then fit in the stitch count without a lot of aggravation! 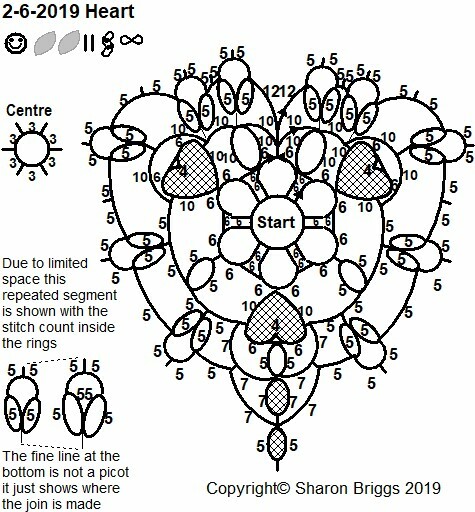 I did an inset to show the proper stitch count and to show the imaginary picots of where the joins are made, so the drawing should be clear enough. I suppose I could have done the drawing over top of the heart JPG which would have fixed that, but when I realized that would have been a better way to go, I already had it mostly drawn. So there you go. I design because it's fun. When designing or creating drawings becomes too onerous, it isn't fun anymore, and at that point, I quit. The design and the drawing thereof may not be great, but there they are. As long as I'm enjoying it I don't mind churning out patterns. They may not be the most elegant patterns around, but hey, what did you expect?😉 I keep telling you I have the attention span of a gnat and I'm already on to the next thing. I think this one is my favourite so far!